The purpose of this Safety Notice is to alert organisations or individuals involved in the design, construction, installation and/or commissioning of electrically-powered gates to potential safety risks to pedestrians. It is also of relevance to organisations in control of the use and/or maintenance of existing electrically-powered gates. It will be of particular interest to gate manufacturers, gate installers, those involved in the commissioning of electrically-powered gates, organisations involved in construction projects including the installation of gates, and persons or organisations in control of premises where persons other than their own employees may have access to such gates, such as site management and/or lettings agents. The information will aid these organisations in identifying any particular hazards in relation to gate design, and then to undertake suitable and sufficient risk assessments as part of their work activities to ensure risks to pedestrians are eliminated and/or controlled. An incident involving the death of a nine-year old child has highlighted possible risks to pedestrians from using electrically powered gates. 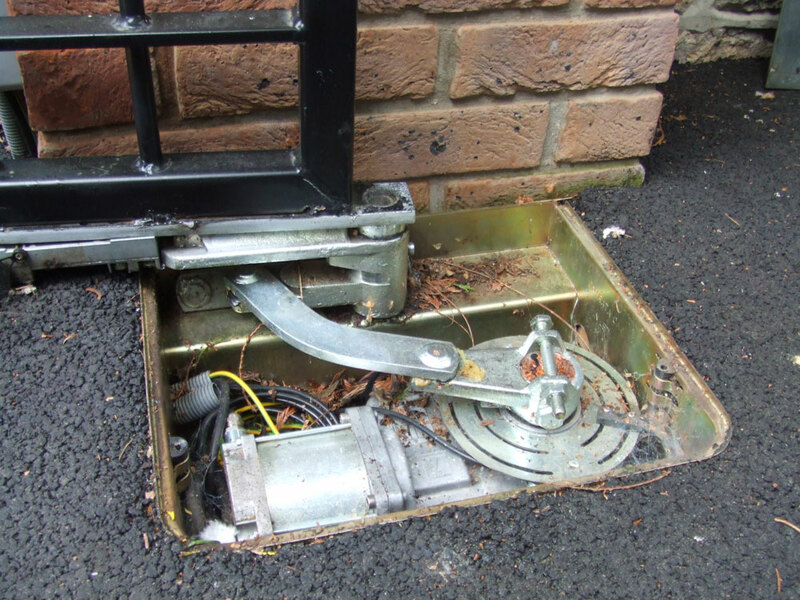 The powered gates involved in the incident were installed across a driveway leading to a block of privately owned flats. They consisted of two wrought-iron style gate leaves which were hung on two brick pillars, one either side of the driveway. Two design issues meant that when the gates were in the closed position a gap existed between the spine of each gate and the brick pillars - large enough for a child to put their head and upper body through. This gap then reduced in size when the gates were opened. The spine of the gates were sat forward of the mounting pin on the motorised arm (located at the heel of the gates). In this instance the term 'spine' is intended to refer to the vertical steel bar located closest to, and parallel to, the face of the brick pillar (see photograph 2). The installation left a gap of 160mm at its widest point between the two vertical surfaces of the gate spine and brick pillar. When activated, the gates would begin to open. The forward position of the spine in relation to the mounting pin on the motorised arm meant that the gap of 160mm between gate and pillar would reduce. In this instance the gates reduced to a gap of 110mm once fully opened. 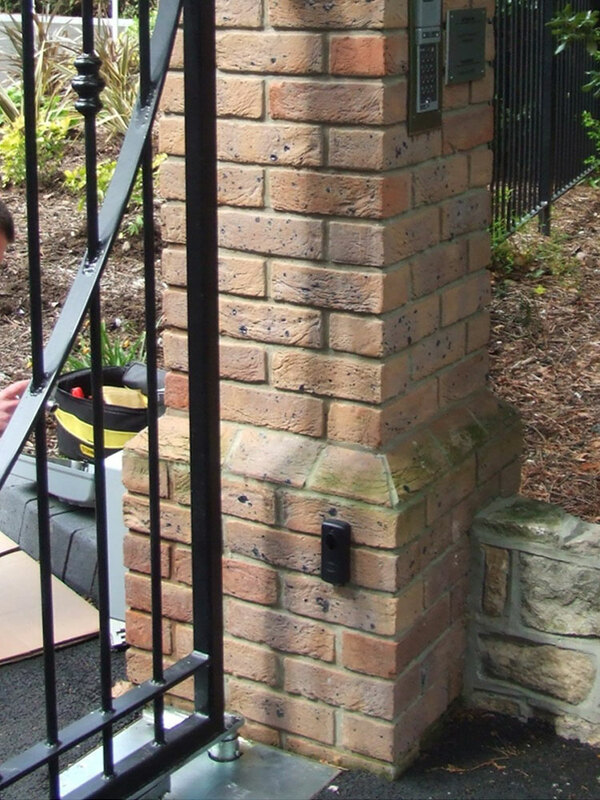 A pedestrian egress button had been placed on the rear of one of the two brick pillars, inside the development. This was intended to allow pedestrians within the development a simple means of activating the gates when leaving the site. The design of this installation meant that the button was within reach of persons on the outside of the development, effectively allowing an unsafe means of activating the gates. On the day of the incident the child approached the gates in order to activate them without using the intercom system or keypad entry system that had been installed. The child reached through the gap between the gate and pillar to press the internal pedestrian egress button. As the gate opened the gap between the spine of the gate and the pillar reduced. As the gap reduced the child became trapped and crushed. The motors on the gates were fitted with amperometric sensors to detect obstacles in the path of the gates once the gates were in motion. If the gates struck an obstacle and met resistance they would stop moving. In this instance the sensors were ineffective due to the forces involved at the spine of the gate. The gates had also been fitted with a light beam sensor between the two pillars. This was intended to detect an obstacle between the pillars to prevent the gates from closing onto a vehicle. It was not designed to identify the presence of a person in the crushing zone nor prevent a person from activating the gates. Where the gates are defined as a machine under the Supply of Machinery (Safety) Regulations 2008 a conformity assessment must be undertaken by a responsible person prior to their use, and a technical file compiled. Any information or instructions required on how to operate the gates should be made available to the person(s) or organisation that the gates are produced for. An EC declaration of conformity should be produced, and the gates CE marked; One way of achieving this is to follow EN12635 from the outset of the project. Regular reviews or assessments are undertaken to ensure that the gates are maintained in a safe condition. The location of the door and the type of door control can have an influence on the level of risk created by a power operated door. the degree of automation is high. Conversely, the level of risk is reduced when doors are used by a limited number of users, are not equipped with any automatic function and are not opening directly onto a public area, i.e. non automatic domestic garage doors used by one household only and which do not protrude directly onto a public area. All danger points as listed in 4.1.1 shall be avoided or safeguarded. Installing sensitive protective equipment (PSPE or ESPE). Permission to reproduce extracts from British Standard BS EN 12453:2001 is granted by BSI. British Standards can be obtained in PDF or hard copy formats from the BSI online shop: www.bsigroup.com/Shop or by contacting BSI Customer Services for hardcopies only: Tel: +44 (0)20 8996 9001, Email: cservices@bsigroup.com.